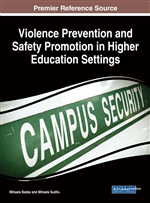 The aim of the study is to help reduce institutional violence in universities by presenting its origins and manifestations, by explaining how they affect the needs of self-realization and individual progress, by providing solutions—viable, we believe—to eradicate this phenomenon. In this respect, the study will be devoted to a deeper diagnostic analysis which would lead to achieving a comprehensive and explicit picture of the causes of institutional violence at academic level and of the specific forms of expression it takes. The following issues will be addressed: institutional dysfunctions; living and working conditions of the main actors in the academic environment; the duplicitous role of the educational institution; university's helplessness, as a core of educational lofty ideals, to voice these ideals and fulfil them. Socio-cognitive theories consider individuals to be active agents of their own lives, recognizing their ability to anticipate and adjust their actions. Therefore, self-system is an extremely important personal component, being made up of all cognitions that reflect the subject’s history, a central element of which is self-efficacy. The feeling of self-efficacy reflects people’s beliefs about their ability to achieve specific performances. They direct the choice of activities and the working environment, they determine the subject’s degree of involvement in achieving the proposed objectives, and they support the individual in their efforts and help him / her manage the emotional reactions generated by the confrontation with certain obstacles. Perception of One’s Own Physical and Emotional State: Monitoring one’s own psychological factors such as fatigue, fear, etc., is an important indicator of self-efficacy. When a person associates an aversive emotional state, like anxiety, with a poor performance of the desired behaviour, it can raise doubts about one’s personal expertise in performing that behaviour and can lead to failure. Instead, individuals will be more confident in their success if they are not riddled with aversive emotional states. These four sources allow people to acquire a certain degree of personal efficiency for a given behaviour. Depending on the time and context in which they appear, each of these sources can act in a complementary manner to the others.